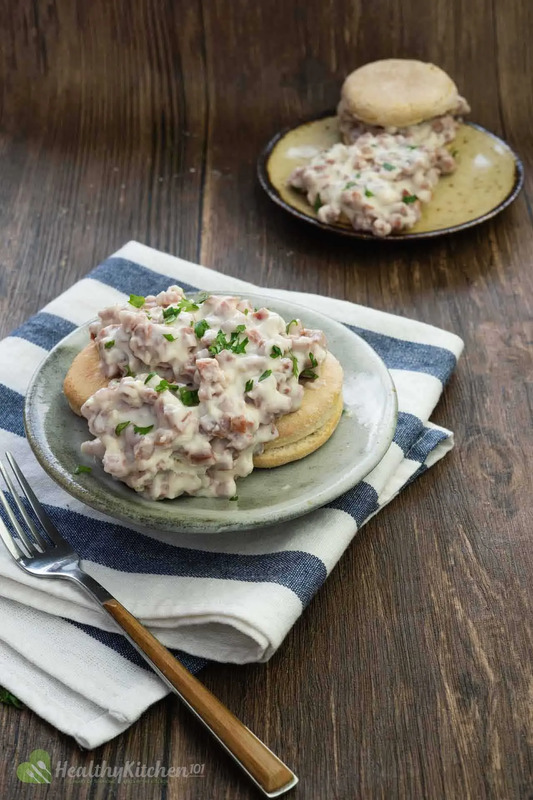 This biscuits and gravy recipe is among one of my favorite weekend breakfast recipes. If you’re wondering why I only make it on the weekends, the answer is simple: it takes a relaxed and clear mind to make flaky biscuits and delicious gravy— and to do the cleaning afterwards! Now, we learned all about biscuits from my honey butter biscuits recipe, so today let’s focus on the gravy. How Do You Make Homemade Country Gravy? What is country gravy, anyway? Country gravy, or sawmill gravy, is basically a type of pan sauce that you make from the pan drippings. The drippings can come from any type of fatty meat like bacon or sausages. If you’ve been throwing the drippings away, it’s time to save some, as they are the keys to a flavorful gravy. Pan drippings: I find it’s a good habit saving pan drippings whenever you can, like when you roast some meat in the oven or make some bacon. Keep them in the fridge and they’ll last for about 2 weeks. You can use them in almost any recipe. I love using them in fried rice as they give the rice a wonderful smoky flavor. Long story short: save your pan drippings. Flour: the flour will be cooked in fat— this technique is called making a roux. This will give body to the gravy. Liquid: normally, I only use milk, but you can also add chicken broth if you have any. If you’re a fan of rich gravy, heavy cream will be a nice touch. And seasonings: aside from salt and black pepper, herbs or spice powders can be added to intensify the gravy. My personal favorite blend is dried oregano, cayenne pepper, and freshly chopped spring onion. For today’s recipe, we will be making sausage country gravy where you will render fat from the sausage meat out. This way you won’t have to worry about not having any drippings in hand. If you follow the basic guidelines, you can make a simple gravy base. Then from that, you can customize however you like. “Does this mean now I can have all the gravy I’ve ever wanted?”, you ask. Well, yes, basically. But I don’t think it’s such a good idea. Is Gravy Good Or Bad For You? Gravy, as we all know it, is probably everyone’s favorite type of sauce. People love it for its versatility. For instance, it goes well with biscuits, steak, roasted turkey, fried chicken, french fries, mashed potato, and even rice! I don’t know about you, but I would just eat gravy every day if I could. But I really shouldn’t. Here’s the reason why. For starters, whether it is store-bought or homemade, gravy is generally considered a high-carb food because it contains white flour as a thickener. Carbohydrates in the flour will then break down into sugar when it is absorbed into the body. So eating too much gravy means adding an excessive amount of sugar to your diet, thus increasing the chance of you getting high blood fat level. Second of all, gravy is fatty. Remember the pan drippings we talked about earlier? They might be the key to a flavorful gravy, but they are as high in calories as they are delicious. It’s sad but true. The pan drippings that we use to make the roux for our gravy is the culprit. They might be the key to a delicious gravy, but they are also high in cholesterol. This can increase your cholesterol level with a possibility of heart diseases and obesity. Another thing is that gravy can be too salty for your consumption. Premade gravy generally has a high sodium level, so does restaurant gravy. Why is that? The answer is simple: salt boosts your taste buds; it increases your appetite. That is why food that has a generous amount of salt, like french fries and pretzels, can be insanely delicious. However, as we all know, salty food isn’t something you should consume on a daily basis as it can be bad for your health. When you eat salty food, your blood pressure will rise, leading to higher chances of heart diseases and kidney failure. That being sad, if your gravy isn’t heavily salted and reduced in fat, it wouldn’t harm your health as much, on the condition that you having a reasonable portion of the gravy. Now then, let’s go make us some biscuits and gravy! I love a good biscuits and gravy recipe. Who wouldn’t love some flaky buttery biscuits with warm savory gravy? Of course it can get messy to make, but you can make it on a Sunday where you don’t have many things to do. You’ll have much time to spend on cooking, and it will be worth every bite. Line a baking sheet with parchment paper. Preheat the oven to 425 degrees Fahrenheit. Take your butter out of the fridge, cut it into small cubes and add to the flour mixture. Using a pastry cutter, cut the cold butter into the flour until the mixture resembles coarse crumbs. Make a well in the center of the flour mixture and pour cold milk into it. Mix with a spoon until just combined. Try not to overmix. Dump the mixture out onto a clean floured work surface and gather the dough to form one mass with your hands. Gently knead to work the dough together. If the dough is too sticky to handle, add more flour and knead the flour into the dough. Once the dough is formed, use your hands to flatten it out into a disc, then fold it in half and pat it down to flatten. Turn the dough on a 90 degrees angle and fold it in half again. Repeat the turning and folding process for 5 more turns. This step will give your biscuits a flaky texture. Using your hands or a rolling pin, gently flatten the dough out to about 1” thick. The, cut out as many biscuits as you can with a cutter and transfer them onto the lined baking sheet, placing ½” apart from one another. If you don’t have a cutter, a straight-sided glass would do. Gather the scraps and gently work them into a dough. Repeat the process by rolling and cutting the dough into biscuits. You should have a total of 7 biscuits. Put the baking sheet in the center of the preheated oven and bake for 10 minutes or until golden brown. Remove from the oven once baked. In the meantime, prepare the gravy. Remove the sausage from the casing, and put the sausage meat in a cold pan. Then turn up the pan to medium-high heat, cook while crumbling the meat into small pieces. You won’t need to add oil as the fat from the sausage will render out. Once the meat is cooked and no longer pink, add ¼ cup of flour to the pan and stir well to mix the flour into the meat and the fat. Cook for about 1 minute or until you no longer see raw pockets of flour. Add milk to the pan a little at a time, stirring constantly to avoid lumps. Add red pepper flakes, stir and cook until the gravy is thickened. To serve: Slice the biscuits in half and pour the gravy over the biscuits. Garnish with extra red pepper flakes and serve warm.